This started as a bit of an experiment. 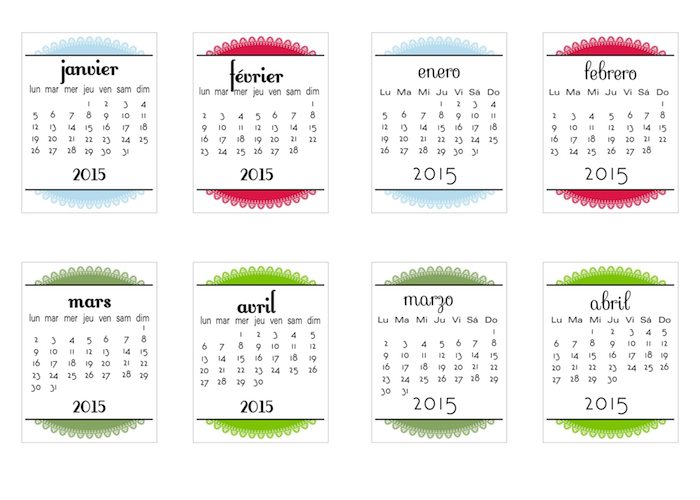 In the past I have done Spanish calendars and they were popular. As I had a flurry of visits from France, I though I might as well go ahead and do a French one too. The major thing is that if what I see online is to be believed both commonly use the Monday to Sunday format. As I had taken the time to do both this year, it seemed an easy thing. The real issue turned out to be the DAY abbreviations! I found a LOT of variation. For the formatting, it is far easier to standardize the day abbreviations and that SEEMS to be acceptable but it is hard to know. I used slightly different fonts. The French one is Fontleroy Brown and the Spanish one is Sevillana – why? they FEEL right, but then what do I know? At the end of the day, they look good to me so there you go. I will be very interested in any feedback from native French or Spanish speakers – how wrong did I get it? It’ll all feed into my future calendars so if you like them and use them, take a moment to let me know. If I got it horribly wrong tell me that too! The SPANISH version is here. Thanks. Happy New Year 2015.